Disclosure: We are sometimes awarded commissions on the sales of products and services featured on this site. We also generate revenue from advertising. Read our disclosure in full here. Requiring four years of self-study, this painting and drawing course created for the serious amateur by Barry John Raybould, MA, is one of the more comprehensive products in this category. The cost is divided into neat quarterly payments of $19.95 making this good value for money. The total cost over four years would be $319.20. Compare this with the instructor-led Famous Artists School Master course costing $1050 by instalment plan. Because this product is not instructor led, the cost is much lower. Learn and Master Painting DVD/text book course is $249 full price, and does include some instructor feedback but not regular assignments as such. 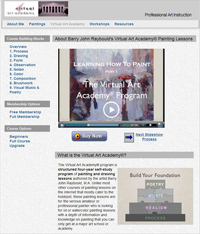 The one advantage of The Virtual Art Academy over our no.1 rated product is that you may cancel your subscription at any time. That said, there is a 60 day money back guarantee on Learn and Master Painting. Barry John offers private tuition at an additional $75 per hour. This works by sending him a copy of your painting by e-mail. He will then send you a detailed written critique and a list of Virtual Art Academy course units you need to work on to improve. He can only take on a limited number of private students at a time, so it is best to contact him first. Make a plan - chart your progress over the long term, even if it is just a little each month. do you like their paintings? are they a full time professional painter? has their work been exhibited in a museum exhibition? This instructor is a professional working artist and the course reflects a high standard of teaching. The difference here between the other more comprehensive products is the way that you pay, and how much is instructor led. This is no paint by numbers course, it is based on serious development of skills and experience. The author's enthusiasm shows through, making the learning experience fun as well as rewarding.